With a recently released and well-received live album, Over the Fall — Live at Nectar’s, and a slew of increasingly packed live performances, Japhy Ryder stand at the front of a gathering storm of local buzz. And so, the Burlington-based prog-rock darlings’ latest studio release, If the Haves Are Willing, debuts amid high expectations. Many proven live acts have struggled to rein in the freedom and spontaneity of live performance in the studio. Yet this quartet meets the challenge head on. Japhy Ryder’s third studio album — and first for Montpelier’s Halogen Records — proves an impressive addition to their already notable catalog. Much like the group itself, the release resists easy classification. Is it funk? Is it jazz? Jazz-funk? Some categorical offshoot as yet unknown? Does it matter? It does not: After a few listens, these questions deflate in importance. 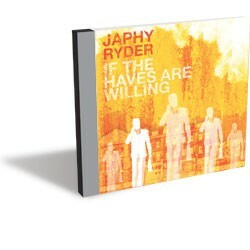 Call them what you will, Japhy Ryder continually triumph in the land of genre ambiguity — a place where so many instrumental bands go to die. The introductory “Das Gut” and “Ain’t That a B” are constructed with Patrick Ormiston’s slinky yet authoritative bass lines escorting Will Andrews’ oily trumpet phrases. This seemingly sets a course for the funk/jazz pigeonhole. However, the blissfully melodic “Can’t Do It” shakes this impression. Guitarist Zack duPont emerges wonderfully, accompanied by Andrews’ splendidly downhearted wails. The schizophrenic “Brother B” further showcases the band’s dexterity, from a simmering groove to an enthusiastic cacophony of brass, blotted out fantastically by distorted guitar, only to return again. “The Fill” revisits the playful funk stylings found at the record’s outset. The song’s melody jostles with duPont’s crafty noodling, and drummer Joshua Pfeil spreads his wings with luscious pings on a ride cymbal. From the sampling of conversational voices on “Ain’t That a B” to the looped guitar tracks at the outset of “Self Set Sail,” the record is reminiscent of the titans of post-rock. Tortoise’s 1998 masterpiece TNT comes immediately to mind, as does the trademark momentous din of bands such as Tristeza or the even more obscure Saxon Shore. These are lofty comparisons, but well deserved. Japhy Ryder can breathe this rarified air with swagger, bolstered by impressive live performances and a growing reputation as a unique and promising ensemble. Japhy Ryder celebrate the release of their new record with two shows this week: Friday, June 25, at Nectar’s in Burlington, and Saturday, June 26, at Positive Pie 2 in Montpelier.